The HYDAC BDM / BDL filters are breather dryers. The inline version BDL and the breather dryer BDM consist of a nonreplaceable filter cartridge only. The breather dryer cartridges contain silica gel (orange) which, once at complete saturation, is impossible to regenerate. 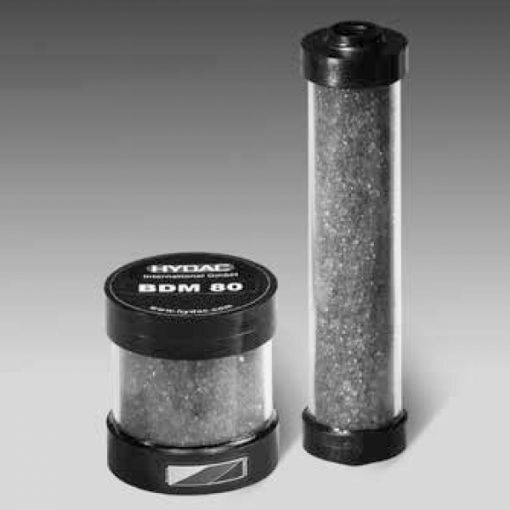 A durable contamination filter above and below the silica gel prevents contamination from penetrating inside the cartridge. Indeed, the particle filtration > 2 µm nominal. Therefore, this ensures optimum humidity absorption. Moreover, to guarantee the performance of the protective filter layers, it’s imperative to replace the entire cartridge. What’s more, when a change of the filter is due, the colour changes from orange to green. On the other hand, filling/breather filters from HYDAC prevent contamination and water from entering the system. It is essential, as the system is usually in connection with fluctuations of the oil level in the tank (tank breathing).